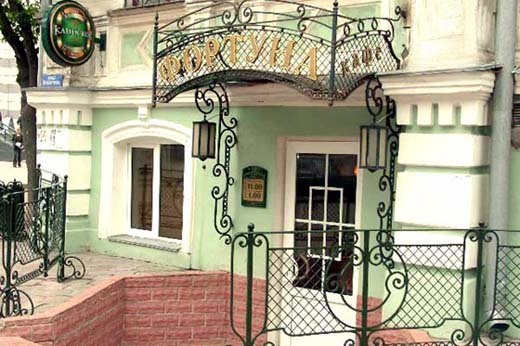 The Fortuna cafe and restaurant is located in the heart of the city in front of the Olymp shopping mall. You can easily find this cozy place, which is very popular among locals. Fortuna is a place for you if you want to enjoy best wine, rare sorts of cognac and beer. The restaurant offers one of the richest wine menu in the city. However, the cafe's style looks more like a bar, and you'll probably find it too murky. However, if you really don't like the style and design of the cafe, and if you need a more comfortable environment you can easily solve this problem. Just enter the building from the other side and you'll get to a small but very cozy restaurant. You'll find a rich and interesting menu, the famous wine menu, and a serene atmosphere, which disposes you to an unhurried and interesting talk. Friendly waitresses will cater for you very quickly. You will find an unheard-of feeling of calm here despite the fact that the restaurant is located almost in downtown. Perhaps, this is the best place for important meetings.